Collects two stories of teamwork and creativity from the childhood years of Judy Hopps and Nick Wilde--two characters from the animated film--especially for younger readers! Judy is excited to tour the fun at the Bunnyburrow County Fair with her Pop Pop, but Dinah has to sneak out of the house to join her! Then, when Pop Pop says no to a hot air balloon ride, Judy still gets her chance in the air when Dinah stumbles into trouble and needs rescuing! It will take both their talents, rabbit and sloth, to ensure that everyone makes it safely home at the end of the day. Meanwhile, Nick learns its the thought that counts when he saves the day at his friend Hedys birthday party. While he might not have enough money to buy a gift, Nick has other talents that he puts to good use for a truly unforgettable celebration. This story collection from writer Jimmy Gownley (Amelia Rules!) and artist Leandro Ricardo da Silva, with colors by Wes Dzioba (Serenity, Star Wars: Invasion, Aliens vs. Predator: Three World War) and letters by Chris Dickey (Cable, X-Men: The Hidden Years), shares two tales of how talent and teamwork can overcome sticky situations. 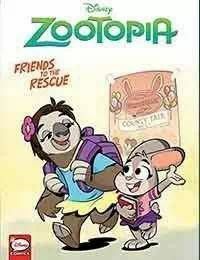 Written for younger readers, this volume will appeal to Zootopia fans of all ages with its adventurous characters and engaging artwork. Also included in this volume are a variety of story-related activities and special features!